Do you like great food and lots of it? Do you like mingling with interesting people, some you know well, some you may have met and others who are new opportunities to make friends. What about wine, beer and spirits? 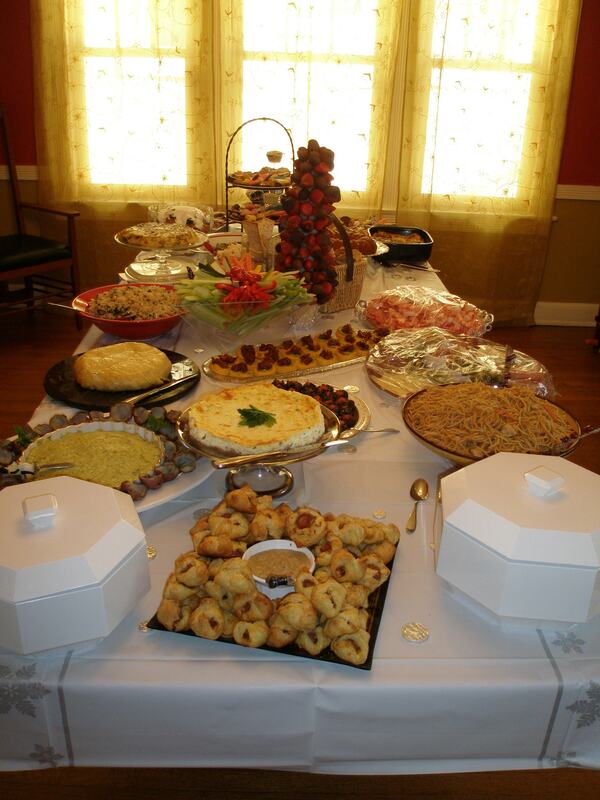 Did I mention the food– savories and sweets. And the presentation. And the food. Then our house was definitely the place to be on Sunday December 16. My wife hosted our annual Holiday Party . I would like to say that wehosted it but lets get real. I run to the store and assist with the set up and clean up. She is baking weeks in advance and cooking for days leading up to this festival. I am unwilling, and undeserving, of taking any credit. And it is wonderful! Let me set the scene and then share the details. Many years ago (10, 12 we are not sure) This party started out as a modest open house for our close friends. We were being with both sides of the family a lot during this time starting with Thanksgiving, my wife and her sisters’ birthdays (all in November) and Hanukkah (we hosted one side of the family each year). But we did not get to spend time with friends. We both have many close friends from different periods in our life who live in the area. Someone, I am guessing not me, came up the the idea of throwing another party. I have no idea how many people got invited that first year. maybe 30 -40? This year’s acceptance list was over 100 with an estimated 80 or so coming through the doors. The party goes from 1 pm to whenever. Some how up early, some later, some stay for hours, others put in an appearance. It was 6:30 or so before the last glass of wine was finished (a Chilean red–quite good). In the intervening hours people come, meet friends they haven’t seen in awhile, mingle with people they never met, make connections, learn about my two names. I like it best when people who know one of us from one part of our lives spend time with people from others. We know so many interesting people that I revel in them getting to know one another. Mostly little groups form of people from the same parts of our lives. That is OK too just not as much fun for me. However, I have only one rule for this party. Have fun and be happy. After all this is a holiday party! No worries about whether other events kept you away this year, how long you can stay, or what you did or who you spent time with. Have fun and be happy. The two names thing. At work for the last ten years I am Richard. I went for the formal when I started with a new company and at my last one people would interchangeably call me Richard or Rick. It became modestly confusing for some clients. All my friends call me Rick except for the ones who have known forever. They add a “y” the end. When work friends mingle with friends friends they usually find the two names thing amusing. This year one of our friends friends heard someone refer to me as Richard as she was leaving. As she walked out the door and down the steps she just kept looking at me quisically and repeating “Richard?”, “Richard?”. Using that quick wit I am known for I mumbled something about a secret life that I would tell her about later. My wife and I spend the party starting many conversations and finishing virtually none. The doorbell rings. More food or drink or ice needs to be put out. Someone comes over to say hi. Still, I would have this party ever week if i could. Being surrounded by friends is my idea of heaven. It takes a little hell to create the heaven. My wife spends weeks or months in advance collecting recipes. There are a few repeated food items but much of the menu gets recreated every year. Did I mention that my wife makes EVERYTHING that people consume? My standard joke is that she does everything except catch the shrimp in the nets. She would do that too if she had more time. She works and reworks her menu up until the last minute. There are savories and sweets. Some of the sweets can be baked and frozen in advance. She does this in her “free” time between work, household chores and her various activities. (Yes the Energiser bunny is jealous of her energy.) Most of the savory items are made within a few days of the party. We have a normal kitchen, not a chef’s kitchen, with one oven, a modest size refrigerator and just a moderately sized extra freezer. The amount of planning and organizing is extraordinary. Not only does she have to plan for storage space but the menu has to have a certain balance because some items require either last minute cooking or at least reheating. Even the dining room table requires planning since space is limited, the amount of food is abundant and presentation is critically important. All serving bowls and plates are laid out in advance with labels on what is going in each one. Then there is the morning of the party. This is where I have to pay tribute to my wife’s friend Carol. (Carol saved our marriage. More on that later.) Carol arrives hours before the party to help set up. This is by no means a small contribution. First, Carol lives far, far away and this year had to shovel snow and drive through snow left by the prior evening’s blizzard. Getting here is the tip of the iceberg. Treys and treys of food have to be set up with each looking gorgeous in its own right. I lack all skills needed for food preparation and presentation. Then as I mentioned food has to be cooked/reheated in order. All this within about 4 hours. My only party prep skills involve going to the store for last minute items and washing dishes. Even setting up the drinks table and laying out the chips gets assigned to my more talented son. We serve in any way we can. Carol also helps replenish food during the party. We could not hire a caterer more skilled, more even keel, more wonderful than Carol. About the whole marriage saving thing. An exaggeration of course — but not by much. Now, years after our first party I have watched the show “Hell’s Kitchen”. I now know that having someone in command and yelling may be key ingredients to pulling off a great meal/party. At the time I was unprepared and unwilling to play the role of staff. It was probably the party’s third year that somehow Carol decided to come over and help. The annual Holiday Party was saved! Not that everything always goes smoothly. My favorite mishap was when the frayed cord from the very, very old coffee maker caught on fire. I was outside the house when someone shouted “Fire”. I ran in, saw the fire and even though somewhere in the back of my head I knew that this was an electrical fire, my first move was to pour water on it. For those of you who do not already know, you try to smother an electrical fire since water just makes it worse. Fire finally extinguished but with 30 minutes to party time our house was filled with an acrid smoke. Oh well, the fire story became the hit of the party and a good time was had by all. The sweets were lead by the Chocolate Dipped Strawberry Tree. The Tree was this year’s festive center piece. In addition to that there were several different cookies including pumpkin, gingerbread bells, thin mints, white sprinkle and orange cookie balls, peanut butterfinger and the unusual stained glass cookies. For those that wanted something other than cookies, one could partake of candy brownies, creamy lemon squares, velvet cupcakes, butterscotch blondies, cheesecake flan, chocolate ricotta cupcakes, nutella wontons or caramelized banana bread pudding. Needless to say no one went away hungry. In case you are interested there are only two ways to get invited to this party. Be or become a good friend between now and December 2008. Incredibly large bribes. See you at next year’s party. How long should it take to check out one item plus the second “free” item that comes with the first? Forget how long the line is. I mean once you hand it to the clerk behind the counter. Two minutes, three at the outside. On this Saturday night over 20 minutes. And if I was not reasonably good doing arithmetic in my head I would have been overcharged by 30%. Here I am in one of the national office supply stores. You would think that the customer experience would be important to this company. I have no need to shop here since there are plenty of alternatives. Interestingly, the workers in the store felt the same way I did. However, they were no match for the computer system. I am sure there are many benefits to the current systems. They help companies quickly track what is selling, help control inventory and even take away the necessity for the employee to have the basic math skills need to make change should someone actually use cash. They do everything but get the customer quickly and happily out of the store. Here was the complexity that threw the system. I went to buy ink for our home printer. I came armed with empty ink cartridges — you get $3 for each one you recycle — and a card worth $10.90 that the company sent me for buying so much stuff there. They must really like me I thought. They even had a deal where you got some paper for free just for purchasing more ink. They did everything they could to get me into that store. I just couldn’t get out. The computer started out doing the right thing. It registered the right price for the ink and showed $0.00 when the paper was scanned. It was the returned ink cartridges and the card that broke the computercamel’s back. Once the clerk tried to apply the discount for the ink, the price of the paper got added back. Then she subtracted the $10.90 and thought she was done. She even gave me a big smile. I pointed out that the amount was wrong. Huh, she pondered. Quick call to the manager. Oh, I can fix this and she subtracted the price of the paper (which was supposed to be free). Unfortunately for all of us the computer spreads the savings from the returned ink cartridge across all items, even the ones you are not supposed to be paying for. It did not take off the full price of the paper and I was still paying too much. Now this was a problem because once the discount card had been entered there is “no going back”. Supermanager to save the day. He looks puzzled. He explains to me that the computer did what it normally does…as if that should be the end of the story. I do the simple math for him and explain that they still owe me several dollars. More puzzlement. The customer seems to make sense but the computer did what it does and the discount card was applied so there is no going back… oh no, what to do???? Well it turns out that after several minutes of thinking you can void everything, start over, do it a little differently and actually come to the correct total. If only the machine would take the credit card that it took moments ago for the incorrect transaction. Only one thing to do now. Pay with cash, give exact change and accept their apologies. The VISA check card commercial makes it seem as if technology makes everything move smoothly. Yet I yearn for the simple days when a cashier, not a clerk, would not have screwed it up in the first place but if something went wrong would just reach into the register till and make it right. This was intended to be topical but I am weeks behind. Let me take you to the not too distant past in my Way Back Machine. Putin, Musharraf, Chavez. Three despots , two of whom were democratically elected, all manuvering to become Ruler for Life. Two are well on their way. One hit a wall. Let’s start with Putin. 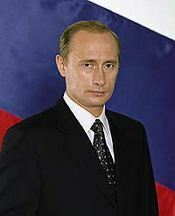 He is in the last months of being the Russian President. Russia’s constitution limits the number of consecutive terms. What are the choices. Retire or change the constitution are the two that most quickly come to my mind. But that is the reason, or at least one reason, why I am not ruler of a major country. Instead, why not take plan to the prime minister job, one not as powerful in Russia as President but that can be manipulated. Then throw your considerable political muscle behind someone you have mentored his entire governmental career for the president role. Not that you suspect that you can control him. Of course not. Then after one four year term by his hand picked lackey Putin is eligible to run for president again. Brilliant. Oh, btw it also gets you Time magazine’s Person of the Year award. At least they had the sense to subtitle the article “A Tsar is Born”. Or you can take Musharraf’s approach. Take control in a military coup. Get on the good side, and substantial funding side, of the world’s most powerful country by becoming an indispensable piece of the War on Terror, from time to time use a little military force and police action to put down opponents, practice (and fail once) at removing the head of the supreme court who is one of the few people willing to stand in the way of absolute power, rig an election to make sure you win and then just before you might be booted out by the courts you declare martial law in order to save democracy. I believe that he found this recipe in the Rachel Ray’s new cookbook 30 Minute Democracies under the dictator for life section between lite appetizers and desserts. I take very little comfort in how he has given up leadership of the military or supposedly restored the constitution. He has already stacked the Supreme Court with people who have sworn loyalty and made changes to the constitution which among other things hold that nothing that happened during martial law can be declared illegal. Key members of the opposition are still under house arrest and I do not have great faith that the upcoming elections will be truly free and without manipulation. Then there is poor Hugo Chavez, the democratically elected, socialist president of Venezuela. he has been riding high. Locally popular, his country’s economy and status raising with oil prices. He seems invincible. But no. First, the King of Spain tells him to “shut up” and the bit of video on this becomes a YouTube hit. Then he tries to take the more conventional route to ruler for life by holding an election to change the constitution in ways that would give him more power and no term limits. Amazingly he loses. How did that happen? Simple. He was so confident in victory that he forgot to rig the elections. Here is what amazes my very jaded view of much of the world. It seems that in many countries there either exists an absolute ruler or the ones that come to power find ways to stick around for as long as they like. Therefore Chavez’s loss provides incredible hope. Now look at the U.S. for the last eight years. Perhaps some rights have been stepped on. The Bush administration has certainly pushed the limits of executive power and privilege to move the President’s agenda ahead. And yet, even with 2 Supreme court appointments no one is going for the Ruler for Life title. I admit I had expected another Bush would have made it to the presidential campaigns but I was wrong. It is hard to tell whether or not the mere fact that our term limits work are a large or small victory. I would still rather be here than Russia. This is more about the ride than going home. Home was the direction at the time. I have a 21 mile commute that can only be done by car — sorry ozone layer. Two things about tonight’s ride. First, I decided that I needed to shut myself down from the outside world for awhile so I plugged in my iPod. No NPR, no news, no deaths, no disasters. Not in my world, not tonight. The music was somewhat soothing but I find that I need to work hard to stay in the moment. Not to think about work or what I need to do once I get home. Just concentrate. Listen. Enjoy. Touch that part of me that I do not get to at work. It is not as if I can do much about work or home while driving anyway. Now can I? Almost there when the phone rings. I had not thought about turning it off. Back to working on being where I am. The second thing about tonight was a tad scary. I have had a bad cold for the past few days. Felt better enough to go to the office today. As a sophomore in high school a bronchial condition developed. Ever since I cannot get a head cold with it transforming into a monster of a cough. People that have heard it are sure that I am death’s door. No big deal most of the time– you sort of get used to it after almost 40 years, sort of. Only time it matters is when I cough so much that it squeezes the air out of me, when it does that so hard when my vision gets fuzzy, when my vision gets fuzzy and I am behind the wheel. Say , like tonight. It is not as if all sight is lost but this time visual clarity took a few seconds longer to return than usual. Maybe I should keep some cough drops in the car—YOU THINK! Actually, I was probably no more distracted than some people are on their cell phones. That is really scary. I am 10 ideas behind in my blogging, buried in work and sick as the proverbial dog. And yet, when I read this article title on npr.org I just had to drop everything and share this with all who read me but do not keep up with NPR. A brain researcher pitted 2 rhesus monkeys against college students. Both groups were shown 2 groups of dots on a monitor and then needed to quickly select between two choices which choice was closest to the sum of the first two sets of dots. To hear the radio version click here. To read the article click here. I just wish there was a YouTube version. I take jazz very personally. When at its finest it is intricate and soulful and moving and hot and cool. Listening to great jazz requires concentration and effort but the rewards are large. Big band music had a place in my parent’s music repertoire and was my exposure in earlier years with Benny Goodman and Glenn Miller being the most notable. I could identify “String of Pearls” by ear (which was available on many a juke box in the mid-to -late 1980s). However I came to truly appreciate jazz in my 20s and 30s once I started frequenting the Jazz Record Mart on the outskirts of downtown Chicago. I became enamored with smaller groups, anything from trio to quintet. It did not matter to me whether the lead was sax, piano, trumpet or guitar. Something about a tight group with an interesting sound fascinated me. The jazz scene in Chicago in the 1980s was robust. Jazz nationally was in a renaissance and clubs sprang up all over. Judy Roberts was a local favorite, She played piano and sang unique interpretations of jazz standards. At a time in my career when I actually took time for lunch we would go on a Friday to Andy’s on east Hubbard. The food was decent and there was always a band at lunch and later after work. The Oyster Bar at 666 LSD (the address was eventually changed to avoid the devil symbolism) drew nationally known groups. It was a small club and the musicians were just in a corner of the room. One evening I stood directly in front of legendary vibraphonist Lionel Hampton. No more than inches from his vibraphone. I chatted with him between sets. To clarify, in the music I love you can hear, and often feel, the individual notes. The synthesized “smooth jazz” that became popular has no place in my listening universe. That “music” puts me to sleep. Here are a few recommendations (not intended by any stretch to be all inclusive of my favorites). I have provided brief descriptions. Jazz, like wine can be described in obnoxious detail. I am never interested in whether the music is dry, fruity and has a hint of oakiness. I either like it or not. Bill Evans, The Paris Concerts Part One. This introduced me to this creative pianist. I have his music leading several small groups as well as solo piano. This particular album defines beauty. Miles Davis, Kind of Blue. The entire album is a must listen but the first track “So What” sets the stage. It is subtle, complex and engaging. Dexter Gordon, The Other Side of Midnight. He is not the most famous of the tenor sax players but one of the most musical. Henry James, King James. Big Band. Some of the songs on this are prosaic but not “Corner Pocket”. I could, and have, listened to this one song over and over. Clark Terry, Ain’t Misbehavin’. Terry has roots in Chicago though a national reputation. Jitterbug Waltz is a must hear for everyone, jazz fan or not. Only requirement is human and still breathing. John Coltrane, John Coltrane with Johnny Hartman. Not only do you get to listen to the Trane but the unique rich baritone of Hartman. There are many great jazz singers, most better known than Hartman. His soft deep voice is something special. The Trane is considered by many to be the last major figure in the evolution of jazz. In later posts I will add to this list but get over to iTunes and get started with these. The three rules of healthy teeth. I religiously do the first two, the third not so much. I assumed at my advanced age that cavities were unlikely. Wrong. Despite brushing 2-3 times a day and flossing regularly I am about to have a tooth extracted and a second one drilled big time. Extracted. Unless I am being airlifted out of a flood zone, that is one ugly sounding word. Ahhh. The sound of a dentist drill. With all of the technology improvements of the last decade one would have thought they could have created a nano sized muffler for those things that if not made them silent at least got them to play show tunes. It is not that I am afraid of the dentist. I do not dream of Little Shop of Horrors or Marathon Man. I just have trouble scheduling appointments given my ever changing schedule. Lesson learned. I will update you on the painful journey of the next several weeks as this tale unfolds. Next Key date: December 17. Drilling. Can’t wait. Whrrrrrr. Gulp.